High drama, as HB Tórshavn win the title in the last minutes of the season. 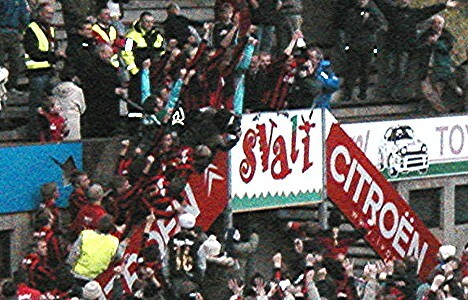 HB's only chance of securing the title was if EB/Streymur lost to KÍ Klaksvík. In addition to that, HB had to win their match against ÍF. But as both matches were locked in stalemates and time was ebbing out, it looked like EB/Streymur were going to win the title. But then, 82 minutes into the match between EB/Streymur and KÍ, events took a dramatic twist, as Poul Clapson put KÍ 1-0 up against EB/Streymur with a long range effort. But EB/Streymur were still champions at this stage, because HB didn't seem to be able to capitalize on this golden opportunity given by EB/Streymur and KÍ. 88 minutes had gone in the match between HB and ÍF, and still HB hadn't scored the crucial goal that would hand them the title. But in a last desperate effort, HB's central defender Vagnur Mohr Mortensen joined the attack. A long high ball was sent into ÍF's penalty area on the left where Vagnur headed the ball over a stranded goalkeeper and into the goal for a 1-0 lead and, more importantly, secured HB the 2006 championship tile. Deep into stoppage time, Rógvi Jacobsen added another for HB, who thereby won 2-0. It was ÍF who made the brighter start to the match and created one or two anxious moments in HB's penalty area. After 10 minutes HB worked their way into the game and had majority of possession, although ÍF were frequent guests on HB's half and occasionally threatened to score. But it was HB who created the better opportunities although they weren't too many. Rógvi Jacobsen had a header across the face of goal that went close, and Rókur av Fløtum Jsepersen had a good long range effort. Páll Mohr Joensen was also close, but his powerful shot hit ÍF-defender Bartal Eliasen right in his face. Ólavur í Olavsstovu curled a shot from 25 meters, aimed at the near top corner, but ÍF's goalkeeper, Andras Gango, just got his fingertips on it. HB also had more of the possession in the second half, but had difficulties creating real scoring opportunities. But ÍF weren't out of the match in the second half either, although they again failed to create clear-cut scoring opportunities. HB's best effort came from Jákup á Borg, who from a very tight angle fired a shot on the near post. When about 78 minutes had gone of HB's match against ÍF, they heard the news that KÍ had taken the lead against EB/Streymur, whose match had started 3 minutes earlier that HB's match. This was a golden opportunity for HB, but they just didn't seem to be able to penetrate ÍF's well organized defense. Was HB really going to throw away the chance of winning the championship by not being able to score against the bottom-team ÍF? Well, it looked like it. In the last minutes of the game, HB threw caution to the wind and moved their central defender Vagnur Mohr Mortensen forward and this proved to be a vice decision! – 88 minutes had gone when a long high ball was sent into ÍF's penalty area, and from the left corner of the penalty area, Vagnur Mohr Mortensen headed the ball over the out-rushing goalkeeper and the ball bounced slowly into the goal for a 1-0 lead to HB. – And more importantly, if HB could hold tight in defense, the championship title! The referee added 4 minutes of stoppage time. But ÍF never came close to threatening HB's victory and 2 or 3 minutes into stoppage time, HB added a second, as Tór-Ingar Akselsen played Rógvi Jacobsen clear in the left corner of ÍF's penalty area and he fired a low shot into the far bottom corner for a 2-0 lead. Congratulations to HB and commiserations to EB/Streymur, who looked to have sewn up the title several weeks ago, but who have faltered right at the finish line by only taking 4 out of a possible 12 points in their last 4 matches, while HB have won their last 6 matches. Commiserations to ÍF also, who had to beat HB to avoid relegation. They fought bravely, but it wasn't enough. 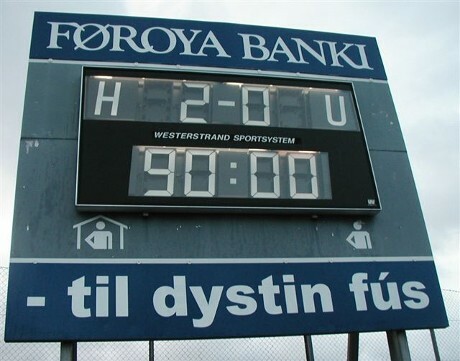 HB Tórshavn beat ÍF Fuglafjørður 2-0 to clinch the 2006 championship title. Soccer can be a cruel game. EB/Streymur knows that all too well. They have been on top of the table practically from start to finish. – Well, let me rephrase that: not "from start to finish" but "from start to just before the finish line". Because now, after the finish line, they are only number 2. Today, they "only" needed a draw against KÍ Klaksvík to win the title and that was also on the card until just 8 minutes from the end, when KÍ's Paul Clapson broke the heart of the EB/Streymur-supporters (and players, of course) with a well taken shot from long range and put KÍ ahead and handed HB the title. EB/Streymur was the better team on the day and hit the woodwork 2 or 3 times during the match. Meinhardt Joensen in KÍ's goal also made some crucial saves. Paul Clapson was originally signed as a goalkeeper, but has only played as a forward all season though. "Why the heck didn't he just play in goal", they're probably swearing in EB/streymur's camp. As runners up, EB/Streymur will be playing in the UEFA Cup next season. KÍ's 4th place secures them a place in the Inter-toto Cup, because no. 3, B36 Tórshavn as Cup winners will play in the UEFA Cup. B36 Tórshavn secured 3rd place after beating GÍ Gøta, who have been coming back into shape lately, after not having won for almost 3 months. B36 took a 2-0 lead with goals from Fróði Benjaminsen and Óbi in each half, before Sam Jacobsen reduced the score late in the second half. VB/Suma was relegated for a while, when Skála took the lead in the first half, and as long as B68 was drawing with NSÍ, but VB/Sumba equalized in the second half, and that was enough to avoid relegation. In order to avoid relegation, B68 had to get a result, and win, if VB/Sumba were getting points against Skála, but B68 failed to do so. NSÍ took the lead midway into the second half with a penalty and in the dying seconds, NSÍ added a second, thanks to the Formula Division's top scorer, Christian Høgni Jacobsen, with his18th goal of the season.